"Hare Krsna can be chanted by any man in any social position, in any country, and in any age, for krsna is the Supreme Lord of all People, in all social positions, in all countries, in all ages." Sparks are beautiful as long as they are in the fire. Similarly, we have to remain in the association of the Supreme Personality of Godhead and always engage in devotional service, for then we shall always be brilliant and illuminating. As soon as we fall from the service of the Lord, our brilliance and illumination will immediately be extinguished, or at least stopped for some time. When we living entities, who are like sparks of the original fire, the Supreme Lord, fall into a material condition, we must take the mantra from the Supreme Personality of Godhead as it is offered by Sri Caitanya Mahaprabhu. By chanting this Hare Krsna mantra, we shall be delivered from all the difficulties of this material world. Caitanya Mahaprabhu introduced the chanting of Hare Krsna, Hare Krsna, Krsna Krsna, Hare Hare/ Hare Rama, Hare Rama, Rama Rama, Hare Hare as a great means of propaganda for spreading love of God. It is not that it is recommended only for Kali-yuga. Actually, it is recommended for every age. There have always been many devotees who have chanted and reached perfection in all ages. That is the beauty of this Krsna consciousness movement. It is not simply for one age, or for one country, or for one class of people. Hare Krsna can be chanted by any man in any social position, in any country and in any age, for Krsna is the Supreme Lord of all people in all social positions, in all countries, in all ages. In this present age quarrels take place even over trifles, and therefore the sastras [scriptures] have recommended for this age a common platform for realization, namely chanting the holy names of the Lord. People can hold meetings to glorify the Lord in their respective languages and with melodious songs, and if such performances are executed in an offenseless manner, it is certain that the participants will gradually attain spiritual perfection without having to undergo more rigorous methods.... all people of the world will accept the holy name of the Lord as the common platform for the universal religion of mankind. There are things which we hear but do not see-the wind may be whistling past our ears, and we can hear it, but there is no possibility of seeing the wind. Since hearing is no less an important experience or valid one than seeing, we can hear Krsna and realize His presence through sound. Sri Krsna Himself says, "I am not there in My abode, or in the heart of the meditating yogi, but where My pure devotees are singing." We can feel the presence of Krsna as we actually make progress. Fire will act, regardless of whether handled by an innocent child or by someone well aware of its power. For example, if a field of straw or dry grass is set afire, either by an elderly man who knows the power of fire or by a child who does not, the grass will be burned to ashes. Similarly, one may or may not know the power of chanting the Hare Krsna mantra, but if one chants the holy name he will become free from all sinful reactions. The effect of chanting the holy name of the Lord is perceived by the chanter as liberation from the conception of false egoism False egoism is exhibited by thinking oneself to be the enjoyer of the world and thinking everything in the world to be meant for the enjoyment of one's self only. The whole materialistic world is moving under such false egoism of "l" and "mine," but the factual effect of chanting the holy name is to become free from such misconceptions. By the grace of the Lord, if a devotee, at the time of death, can simply chant His holy names-Hare Krsna, Hare Krsna, Krsna Krsna, Hare Hare/ Hare Rama, Hare Rama, Rama Rama, Hare Hare-simply by chanting this maha-mantra, he immediately surpasses the great ocean of the material sky and enters the spiritual sky. He never has to come back for repetition of birth and death. Simply by chanting the holy name of the Lord, one can surpass the ocean of death. The transcendental ecstatic attachment for Krsna which results from perfectly understanding that Krsna's person and name are identical is called bhava [ecstatic spiritual emotion]. One who has attained bhava is certainly not contaminated by material nature. He actually enjoys transcendental pleasure from bhava, and when bhava is intensified, it is called love of Godhead. Lord Caitanya taught that the holy name of Krsna, called the maha-mantra (great chanting), enables anyone who chants it to attain the stage of love of Godhead, or intensified bhava. Christos is the Greek version of the word Krsna. When an Indian person calls on Krsna, he often says, "Krsta." Krsta is a Sanskrit word meaning "attraction." So when we address God as "Christ," "Krsta," or "Krsna," we indicate the same all-attractive Supreme Personaiity of Godhead. When Jesus said, "Our Father, who art in heaven, sanctified be Thy name," that name of God was "Krsta" or "Krsna." Actually it doesn't matter-Krsna or Christ-the name is the same. The main point is to follow the injunctions of the Vedic scriptures that recommend chanting the name of God in this age. I have not come to teach you, but only to request you to please chant the name of God. The Bible also demands this of you. So let us kindly cooperate and chant, and if you have a prejudice against chanting the name Krsna, then chant "Christos" or "Krsta"-there is no difference. 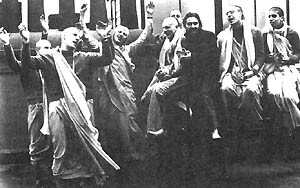 Sri Caitanya said: namnam akari bahudha nija-sarva-saktis. "God has millions and millions of names, and because there is no difference between God's name and Himself, each one of these names has the same potency as God." Therefore, even if you accept designations like"Hindu," "Christian," or "Muhammadan," if you simply chant the name of God found in your own scriptures, you will attain the spiritual platform We always have these beads, just as you have your rosary. You are chanting, but why don't the other Christians also chant? If you would like to cooperate with us, then go to the churches and chant, "Christ," "Krsta," or "Krsna" What could be the objection? The mind is always concocting objects for happiness. I am always thinking, "This will make me happy," or "That will make me happy. Happiness is here. Happiness is there." In this way the mind is taking us anywhere and everywhere. It is as though we are riding on a chariot behind an unbridled horse. We have no power over where we are going but can only sit in horror and watch helplessly. As soon as the mind is engaged in the Krsna consciousness process-specifically chanting Hare Krsna, Hare Krsna, Krsna Krsna, Hare Hare/ Hare Rama, Hare Rama, Rama Rama, Hare Hare-then the wild horses of the mind will gradually come under our control. The earth is the property of God, but we, the living entities, especially the so-called civilized human beings, are claiming God's property as our own, under both an individual and collective false conception. If you want peace, you have to remove this false conception from your mind and from the world. This false claim of proprietorship by the human race on earth is partly or wholly the cause of all disturbances of peace on earth. Foolish and so-called civilized men are claiming proprietary rights on the property of God because they have now become godless. You cannot be happy and peaceful in a godless society. In the Bhagavad-gita Lord Krsna says that He is the factual enjoyer of all activities of the living entities, that He is the Supreme Lord of all universes, and that He is the well-wishing friend of all beings. When the people of the world know this as the formula for peace, it is then and there that peace will prevail. Therefore, if you want peace at all, you will have to change your consciousness into Krsna consciousness, both individually and collectively, by the simple process of chanting the holy name of God. This is a standard and recognized process for achieving peace in the world. We therefore recommend that everyone become Krsna conscious by chanting Hare Krsna, Hare Krsna Krsna Krsna, Hare Hare/ Hare Rama, Hare Rama, Rama Rama, Hare Hare. This is practical, simple, and sublime. Four hundred and eighty years ago this formula was introduced in India by Lord Sri Caitanya, and now it is available in your country. Take to this simple process of chanting as above mentioned, realize your factual position by reading the Bhagavad-gita As It Is, and reestablish your lost relationship with Krsna, God. Peace and prosperity will be the immediate worldwide result. Recently, an Indian yogé came to America to give some "private mantra." But if a mantra has any power, why should it be private? If a mantra is powerful, why should it not be publicly declared so that everyone can take advantage of it? We are saying that this Hare Krsna maha-mantra can save everyone, and we are therefore distributing it publicly, free of charge.... The devotees are preaching without charge, declaring in the streets, parks, and everywhere, "Here! Here is the Hare Krsna maha-mantra Come on, take it!" Lieutenant Mozee: Would there be more of a beneficial influence-more of a strengthening of the community-if the program [congregational chanting] were held in a poorer area rather than an affluent area? Srila Prabhupada: Our treatment is for the spiritually diseased person. When a person is afflicted with a disease, there are no distinctions between a poor man and a rich man. They are both admitted to the same hospital. Just as the hospital should be in a place where both the poor man and the rich man can easily come, the location of the sankirtana facility should be easily accessible to all. Since everyone is materially infected, everyone should be able to take advantage. So our chanting process is for everyone, because it cleanses the heart, regardless of the man's opulence or poverty. The only way to permanently change the criminal habit is to change the heart of the criminal. As you well know, many thieves are arrested numerous times and put into jail. Although they know that if they commit theft they will go to jail, still they are forced to steal, because of their unclean hearts. Therefore without cleansing the heart of the criminal, you cannot stop crime simply by more stringent law enforcement. The thief and the murderer already know the law, yet they still commit violent crimes, due to their unclean hearts. So our process is to cleanse the heart. Then all the troubles of this material world will be solved.